This, the smallest of the Catapyrenium species in Ireland, has tiny green-brown, white frosted squamules to 3mm diam. 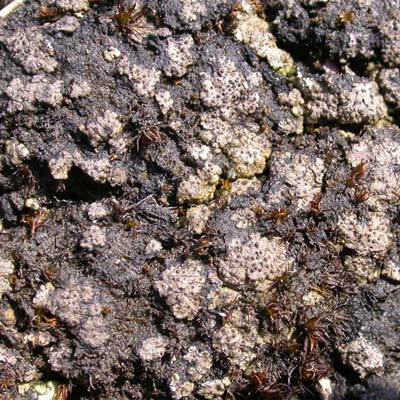 speckled with discs (perithecia) forming a thin skin within mossy, soil-filled cervices, walls, or on bare , consolidated soils. It is rare generally and known only from coastal parts of western Ireland including islands off the coast of County Mayo. Formerly it was also known to be present in Connemara, County Galway. The species avoids acid rock unless modified by calcareous shell sand. Simms, M. J., (2016). Catapyrenium cinereum (Pers.) Körb.. [In] LichenIreland.